Posted by occhristiancounseling in attachment, Dr. Debi Smith, understanding men, understanding women. A Man is creatively designed to lead, and his woman’s trust and respect are essential for him to be able to lead well. He excels in her affirmation. He stands taller in her admiration. And he adores her more than words can say. But He’s actually more sensitive than she is … and to different things than she is. His sensitivity is primary when it comes to her. Which motivates him to protect her. To provide for her. To be willing to die for her. Let’s talk about it! Send me your questions and comments now. And I’ll send you a personal reply! Without her, he’s got no hope for becoming all that he could be. And you can’t be a leader if no one is willing to follow you. She has so much in common with a man. She’s very much like him, yet so very different. She’s soft and curvy. Smells sweet. Emotionally sensitive. Expressive. She sees things differently than he does. Which makes him wonder how she comes up with stuff. But that’s how she’s got his back. As well as how he’s got hers! Eve was created for Adam. He didn’t even know he needed anything. But God did. And she was exactly what he needed. Likewise, Adam was exactly what Eve needed. He was her Joy and Bliss. Man and Woman are made for each other. We get to enjoy this Truth as we follow the Holy Spirit. Why on earth would we want to listen to the enemy? Clearly Adam and Eve were made in the likeness of God … and made for each other. The enemy hated their Image (identity) and their Romance (relationship). Posted by occhristiancounseling in attachment, development, Dr. Debi Smith, research, understanding men. Posted by occhristiancounseling in attachment, dating, Dr. Debi Smith, emotions, marriage, research, sexuality, understanding men, understanding women. Life is filled with Simple Moments that make life special … if you notice them! Posted by occhristiancounseling in attachment, development, Dr. Debi Smith, marriage, Q & A, recommended reading. Male-female relationships can be difficult. Both genders need understanding and skills to have great connections. 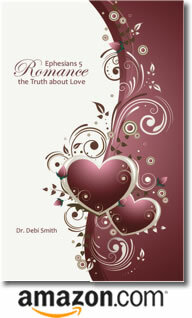 Dr. Debi Smith has written a great book with biblical understanding, research-based principles, and applicable skills. The material will make significant gains in any relationship. I highly recommend this book. Posted by occhristiancounseling in attachment, classes, development, Dr. Debi Smith, marriage, recommended reading, research, sexuality, stonewalling, understanding men, understanding women. Men Are Not From Mars. Women Are Not From Venus. Men Don’t Have Waffle Brains. And Women’s Brains Are Not Made of Spaghetti. We’re from the Same Planet! And we were created by the same All-Wise God. different life purposes and experiences. Want to know more? Here it is! Posted by occhristiancounseling in attachment, dating, Dr. Debi Smith, marriage, recommended reading, research, stonewalling, understanding men, understanding women. Posted by occhristiancounseling in attachment, development, Dr. Debi Smith, marriage, recommended reading, research, stonewalling, understanding men. An understanding of men necessarily includes a healthy respect for the Man Cave. But as women we typically have a really hard time with it. We have nothing to compare it to, so it simply doesn’t make sense to us. But it makes a lot of sense to men. When we’re worried about something, we usually want someone to walk and to talk though it with us. For the most part, our American culture has trained us to do just that. However, the same culture has taught him to do the opposite! Remember the story of what typically happens to the toddler boy on the playground? Those early experiences were the beginning of his education in The Boy Code. He learned that a man has to appear tough – a Sturdy Oak – in order to be loved and respected. And he learned that a man must figure out his own problems and deal with all his vulnerable emotions – anger, sadness, fear, hurt, grief, shame, guilt, and doubt – on his own. So that’s what he does, and he does it in the Man Cave. Looking at it from our side of the wall, the Man Cave feels like stonewalling at best and abandonment at worst. Simply knowing that her man is struggling is not enough, because that only serves to trigger a woman’s natural desire to reach out and encourage him … to get him to talk to her … to try to convince him that she is his Safe Haven. But a lifetime of experience has taught him otherwise. Her efforts to connect will feel like an invasion to him. And this invasion typically results in immediate defense – usually by strengthening his wall. And being shut out makes her more anxious … worried about him … and about herself. It feels like the Beginning of the End to her, and she often doesn’t understand why. So she tries to fix it. But first she has to get through the wall. Drastic times call for drastic measures … so she hauls out the Wrecking Ball. Nope. There’s so much more you can do to help him! Posted by occhristiancounseling in attachment, Dr. Debi Smith. A huge heartfelt thanks to our men for all they do to provide for their families and keep them safe, and for being their guiding light throughout life. You’re the best! May God bless you and strengthen you.